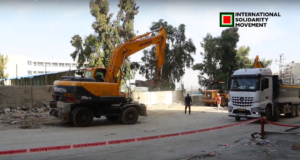 A group of over 30 demonstrators came to Al-Walaja today at 7am to obstruct the path of a bulldozer being used to construct the illegal annexation wall. Three demonstrators were arrested during the action; the legitimacy of two of the arrests remains in question. Among the arrested was former Yale Professor Mazin Qumsiyeh. The activists were successful in stopping construction for an hour by chaining themselves to the bulldozer. Israeli activist Shay Halatzi was also arrested under the allegation of “being rude” by insulting the unit as he protested Dr. Qumsiyeh’s detention. Both arrests occurred after the morning demonstration was over and activists were being forced to leave the area. The soldiers threatened the entire group with arrests, after the group had dispersed from the area where the activists had interrupted the work of the bulldozers for approximately 40 minutes by chaining two activists to the apparatus. 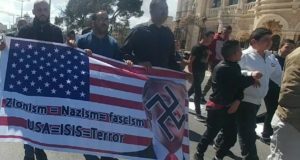 At one point during the demonstration, the Israeli contractor in charge of the site attempted to attack the demonstrators and had to be forcibly restrained by the military. After being forced by soldiers onto the village roads, the crowd then staged a peaceful sit-down demonstration as soldiers prevented demonstrators from moving. Qumsiyeh was released at 14:00. The Israeli activists were released at 16:30 with conditions preventing them from coming within 500 meters of the wall’s construction sites. This is another stage in the construction of the wall that will completely surround Al Walaja. Passing within 5 meters of houses, the wall will separate the village from Jerusalem and leave just one exit, a tunnel to Beit Jala. 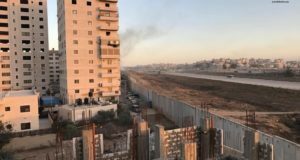 The claim that the wall, illegal under international law, is being built for security reasons was refuted when retired colonel Dani Tirza, who designed the wall’s route, was hired by the “Givat Yael” company. Givat Yael plans to build a 14,000-housing-unit settlement around the village. Tirza criticized the route, writing that it takes land from the planned settlement and that there is no security need for it.